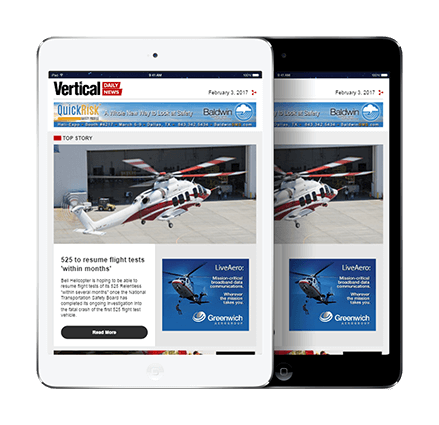 The U.S. Federal Aviation Administration (FAA) has effectively grounded some helicopter human external cargo (HEC) operations it permitted for years, after deciding that the cargo hooks being used are not appropriately certified for HEC applications. The FAA has issued a Safety Alert For Operators (SAFO) and Special Airworthiness Information Bulletin (SAIB) addressing the issue, and has instructed helicopter operators to discontinue HEC operations with attaching means not certified to the HEC requirements of 14 Code of Federal Regulations (CFR) part 27 or 29. That is having a particularly significant effect in the U.S. power utility sector, where HEC is widely used for such tasks as moving line technicians onto transmission structures and installing marker balls. Currently, most of this work is being performed by MD 500 series helicopters, but no HEC-certified attaching means exist for these aircraft. Since the FAA has been overseeing these operations for years, many operators are perplexed as to why the agency has suddenly decided to disallow them in the absence of a compelling safety concern. The FAA has encouraged operators to petition for time-limited exemptions to continue their HEC operations, but some operators have already been waiting more than three months for the FAA to rule on their petitions. 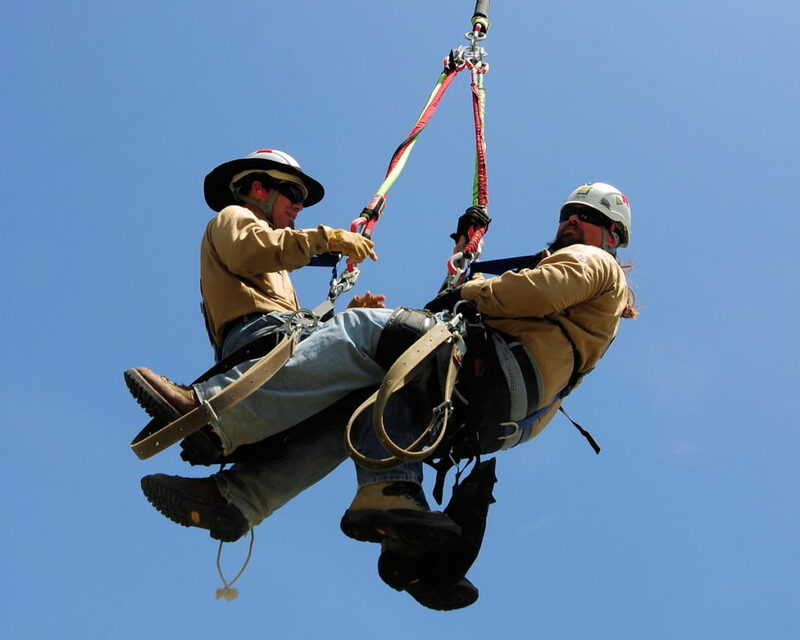 In the meantime, the power utility industry may be incurring not only economic costs, but also increased safety risks if operators switch to less appropriate work methods. 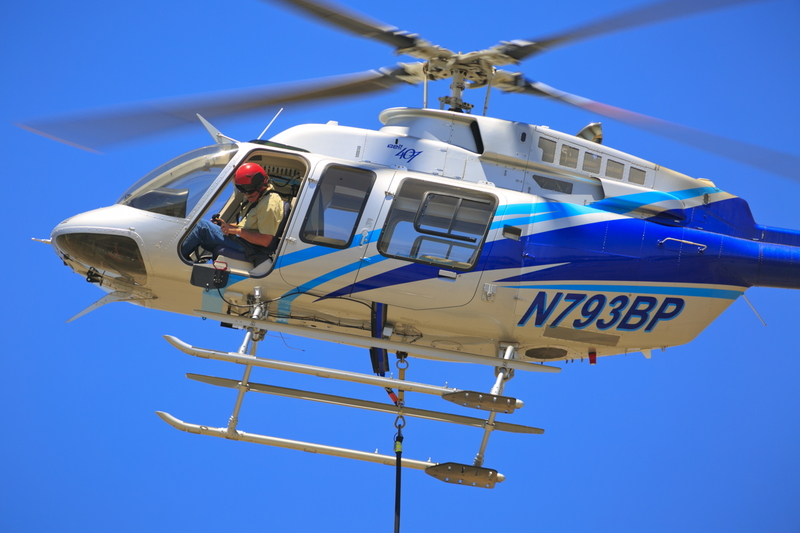 Compared to transporting line technicians on the skids of a helicopter, HEC methods keep the aircraft well clear of power lines and structures, reducing the potential for a catastrophic rotor strike in certain applications. In the U.S., rotorcraft external load operations are regulated under 14 CFR part 133. Rotorcraft external loads are classified as A, B, C, or D. The most common type of external load is Class B, “in which the external load is jettisonable and is lifted free of land or water during the rotorcraft operation” — as is the case with cargo at the end of a long line. Class D external loads can include humans who are not essential crewmembers, such as marine harbor pilots who are flown by helicopter to the ships that they will navigate into port. Class D external load operations have specific safety requirements, including the use of multi-engine helicopters with adequate single-engine hover capability. However, the FAA has established that humans can also be carried as Class B external loads, provided they are essential crewmembers or necessary to accomplish the work activity directly associated with the operation. 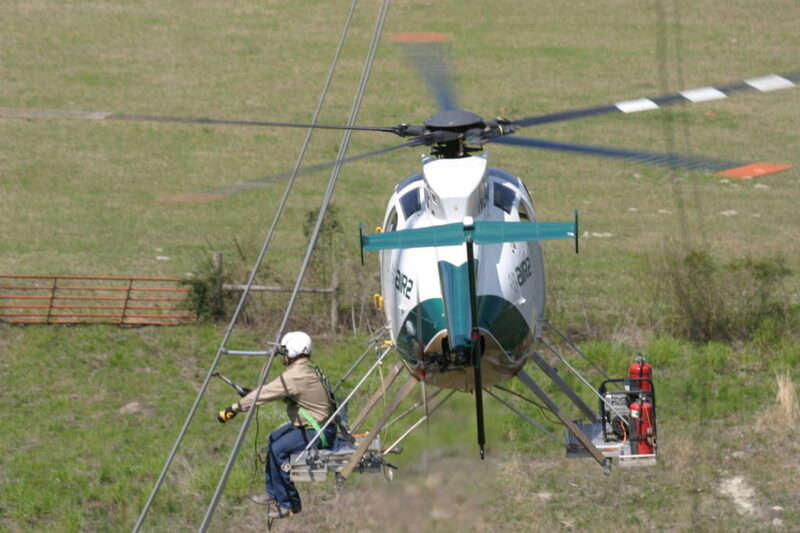 That interpretation has allowed Class B HEC operations to flourish in the U.S. power utility industry, with helicopters now routinely using long lines to transport technicians to the overhead power lines where they need to work. 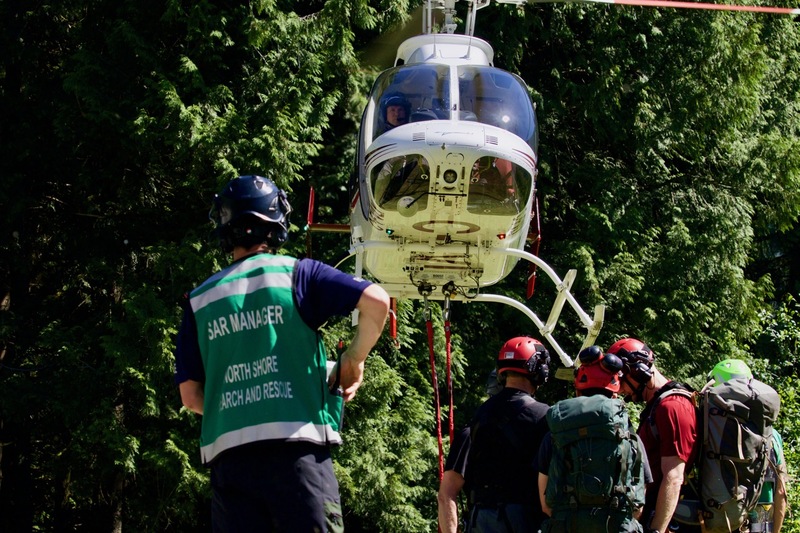 Class B HEC techniques are also used by some public aircraft operators for search-and-rescue (SAR) missions, such as high-altitude mountain rescues in National Parks. They are also used extensively in government marijuana eradication programs to transport agents to remote grow sites. Because there are no specific regulations requiring multi-engine aircraft for Class B HEC, many operators in both the power utility and public sectors use single-engine helicopters due to their size, affordability, and better high-altitude performance. In the power utility sector, helicopters in the MD 500 series (developed from the Hughes 369) are particularly popular because of their small footprint and exceptional agility. Most of these aircraft are equipped with a single cargo hook for external loads. To guard against inadvertent release of people at the end of the line, many if not all HEC operators use a back-up retention system or portable safety device (PSD) such as a “belly band,” which extends through the cabin of the helicopter to provide a secondary attaching means for the external crewmember. At one point, the FAA was threatening to disallow belly bands due to questions about their legality. However, in a September 2012 Information for Operators letter (InFO 12015), the FAA affirmed that belly bands are permissible and do not require a supplemental type certificate (STC) because they are not permanently installed in the aircraft. Since that time, U.S. helicopter operators have flown tens of thousands of Class B HEC missions using belly bands or other back-up retention systems (the California Department of Justice alone has recorded more than 100,000 Class B HEC operations in support of its marijuana eradication efforts). And while there have been some recent accidents during HEC operations, none of these have been associated with defects in the external cargo hooks used to carry external crewmembers. For example, in one high-profile accident near Childress, Texas, in 2012, a utility worker suspended on a long line was killed when the Brim Aviation MD 500D he was attached to lost engine power due to fuel exhaustion. The National Transportation Safety Board (NTSB) determined the probable cause of that accident to be improper maintenance resulting in erroneous fuel gauge indications, combined with the pilot’s inadequate fuel management. Also causal was the lack of company procedures to ensure adequate maintenance and fuel planning, the NTSB said. More recently, in November 2017, two linemen were killed in an accident involving an MD 500D operated by Winco near Sulphur, Louisiana. In that case, the linemen fell about 100 feet to the ground when the external cargo long line that was holding them severed after contacting a shield wire. The NTSB investigation into the accident is ongoing. Nevertheless, in May of last year, the FAA suggested that it might increase scrutiny of the equipment used for HEC operations when it issued revised Advisory Circular (AC) 133-1B, the first update for that AC since 1979. In providing specific guidance for Class B HEC operations, the AC draws heavily on best practices developed by Helicopter Association International’s (HAI’s) Utilities, Patrol, and Construction (UPAC) Committee. These include many recommendations developed with human factors in mind, including guidelines for pilot and crewmember training and qualifications, and suggestions for daily briefings and communications. The AC affirms that PSDs/belly bands are permissible for Class B HEC operations, but notes that operators who choose to use a PSD should apply the additional cargo hook equipment upgrades for HEC specified by 14 CFR 27.865. Among other things, 27.865 calls for substantiating a higher static limit load for the external-load attaching means; substantiating more stringent electromagnetic interference and lightning protection for the quick-release system in the aircraft; using a personnel carrying device system (PCDS) with improved structural integrity and personnel safety features; and conducting a fatigue evaluation of the aircraft quick-release system, attaching means, and PCDS. Advisory circulars are, by definition, advisory; they do not have regulatory power. Because there are currently no regulations addressing Class B HEC operations specifically, the FAA can’t enforce the best practices in the AC related to pilot and crewmember training. By contrast, 14 CFR 27.865 is a regulation and therefore enforceable. When belly bands came under scrutiny in 2012, 27.865 was reviewed extensively in the context of Class B HEC operations with PSDs before the FAA decided to allow those operations to proceed. But over the past six months, the FAA has concluded that many of the operations it has authorized over the past six years aren’t in compliance with 27.865 after all. According to statements provided by the FAA, during an accident investigation late last year, the agency became aware of non-HEC-certified external cargo hook kits being used to carry people. It’s not clear why that came as a surprise to the FAA, since external cargo hook kits specifically certified for HEC have never existed for many of the single-engine helicopter models being used for Class B HEC work, notably MD 500s. In fact, there is only one company that has certified 27.865-compliant HEC systems with the FAA. That is Boost Systems out of Vancouver, British Columbia, which originally developed its HEC systems to comply with Transport Canada Civil Aviation requirements. 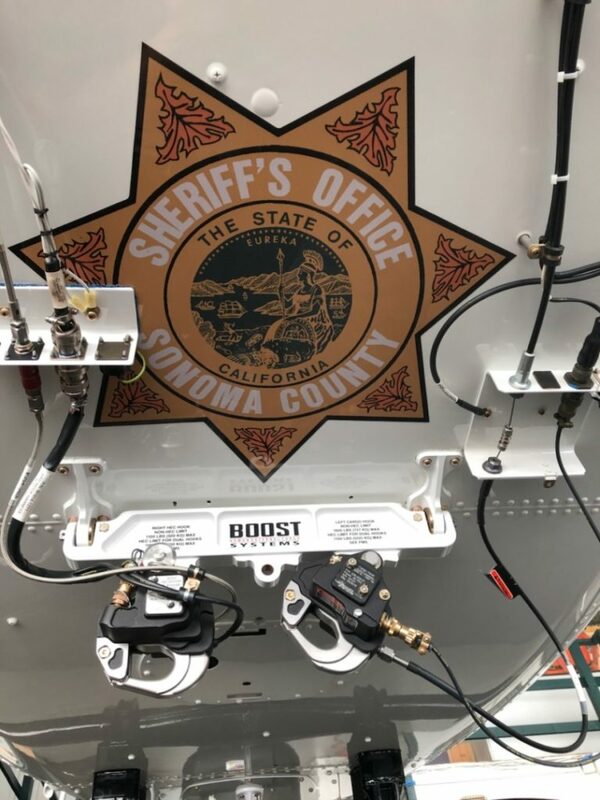 Following a long and expensive development and certification process, Boost obtained an FAA STC for its HEC system for the Airbus AS350/355 series in March 2016, and for its Bell 407 HEC system in March 2017. The company is now developing a system for the MD 500, but does not expect to certify it until October 2018. As previously reported, the FAA indicated earlier this year that it was increasing its scrutiny of the equipment used by HEC operators, telling Vertical in February, “Operators are strongly encouraged not to conduct HEC operations with attaching means not certificated to the part 27/29 HEC requirements.” Later that month, at a contentious UPAC meeting at HAI Heli-Expo 2018 in Las Vegas, Nevada, the FAA told operators that they could petition for a time-limited exemption to continue their HEC operations until such time as a 27.865-compliant solution became available for their aircraft. Concurrently with the SAFO and an associated Special Airworthiness Information Bulletin (SAIB SW-18-15) dated May 30, many FAA Flight Standards District Offices (FSDOs) have asked operators performing Class B HEC to immediately discontinue operations involving attaching means that do not meet part 27 requirements for HEC. Although the FSDOs have phrased this as a request, not an order, many operators have felt obligated to comply. As Wilson Construction’s Ron Stewart put it, “We can’t continue to operate without the support of our FSDO.” Wilson operates six MD 500s in support of its work building and maintaining power lines, and Stewart said the cessation of HEC operations is negatively affecting the company as well as its customers. “By removing HEC from our toolbox, we’re being forced to re-evaluate other work methods that are not ideal,” he told Vertical. For example, Wilson prefers to use HEC to install marker balls, because the method keeps the helicopter and its rotors well clear of power lines. Without that ability, “we’re going to probably tell our customers we’re not hanging marker balls until we can go back to the safer method,” Stewart said. Although HAI in 2012 was active in lobbying the FAA to permit Class B HEC operations with belly bands, the organization is not challenging the FAA’s actions in grounding HEC operators now. According to Harold Summers, director of flight operations and technical services for HAI, the language in 27.865 and the guidance in AC 27-1B Section “D” are “clear”; currently there is no legal way for MD 500/Hughes 369 helicopters to conduct HEC operations, as no certified systems exist for those aircraft, he said. However, other FSDOs have been less assertive in asking HEC operators to stand down, and some operators have disputed the idea that their operations — which have been closely surveilled by the FAA for years — are suddenly noncompliant. In a public filing on www.regulations.gov, A&P Helicopters of Richvale, California, pointed out that while 14 CFR 133.45(e) requires that the personnel lifting devices used in Class D HEC operations be FAA-approved, there are no similar requirements in part 133 for Class B operations. Given that the FAA specifically approved the company’s Rotorcraft-Load Combination Flight Manual, including a detailed description of its Class B HEC procedures and equipment, A&P maintains that all of the aircraft listed on its certificate are airworthy and approved to carry Class B loads, human or otherwise. For that reason, A&P has continued to conduct HEC operations, although it has joined other operators in petitioning for a time-limited exemption should the FAA deem one necessary. At the time this story was published, 20 operators had submitted petitions to the FAA for an exemption that would allow them to continue their Class B HEC operations using equipment not certified to the requirements of 27.865. According to Summers, the petition for exemption submitted by Haverfield International is the first one under consideration by the FAA; that petition was initially posted to regulations.gov on March 8. By law, the FAA has 120 days to respond to petitions for exemption; “however, unforeseen events may occur that could affect that time limit,” an FAA spokesperson told Vertical. Summers said he has been speaking to the FAA multiple times per week on the issue of HEC exemptions, and “I personally know they are doing everything they can to expedite,” he said. However, with more than 100 days having elapsed since the time Haverfield submitted its petition for exemption, “expedite” is clearly a relative term. 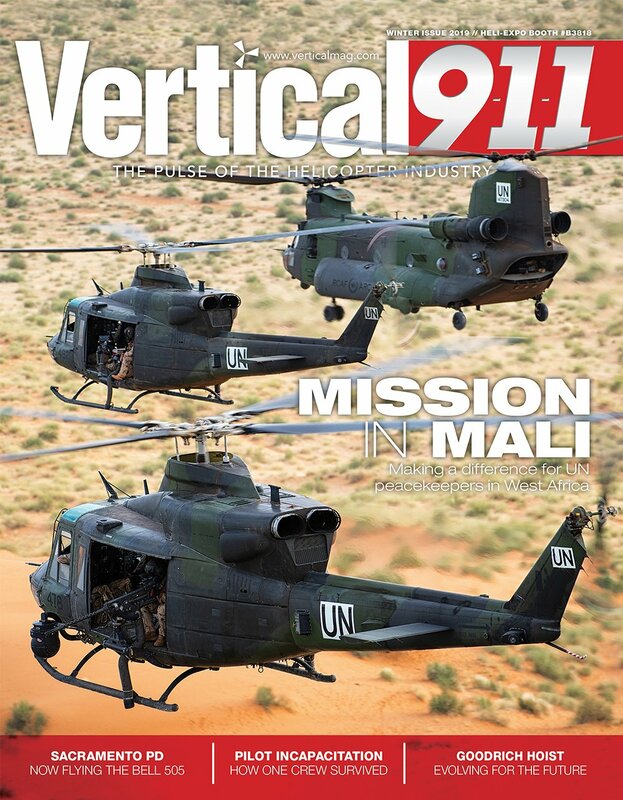 To satisfy the FAA, some HEC operators have turned to AS350 or Bell 407 helicopters equipped with the Boost Systems HEC kit, which retails for US$85,000. 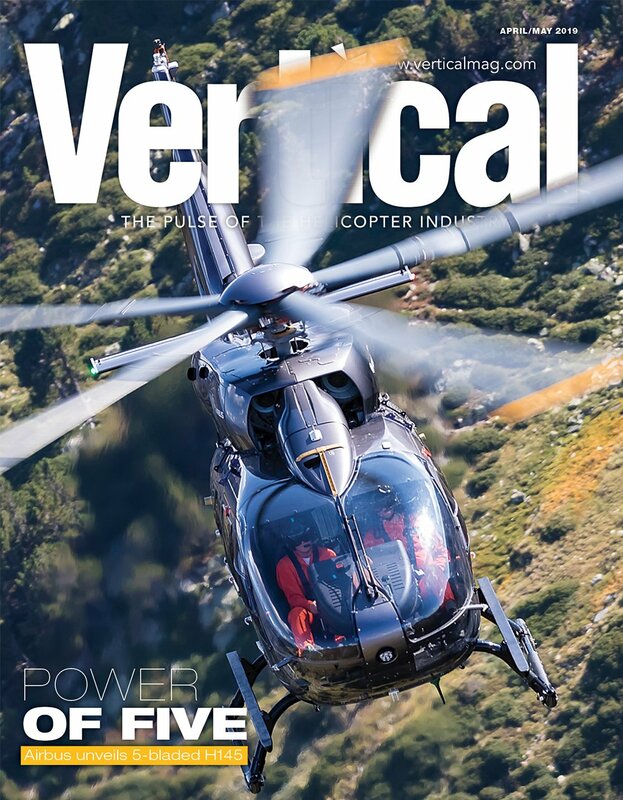 Boost vice president of operations Jeff Yarnold said that the company is doing its best to keep up with demand, and to accelerate its MD 500 certification project, which will benefit from the fact that the company already holds FAA STCs for other helicopter models. 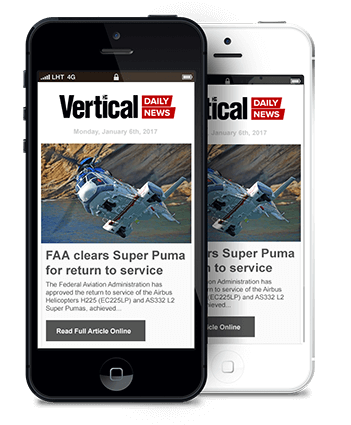 “I feel bad for some of the [grounded] operators — nobody likes that, including us,” he told Vertical. That said, he noted that Boost received little interest in 27.865-compliant HEC systems from the power utility industry until the FAA started putting its foot down. “If we had had more interest, we would have had the 500 done by now,” he said. As the industry scrambles to find ways to comply with the FAA’s new insistence on HEC-certified cargo hooks, some operators are concerned that safety may be compromised in the process. Although HEC has inherent risks, so does power utility work generally. 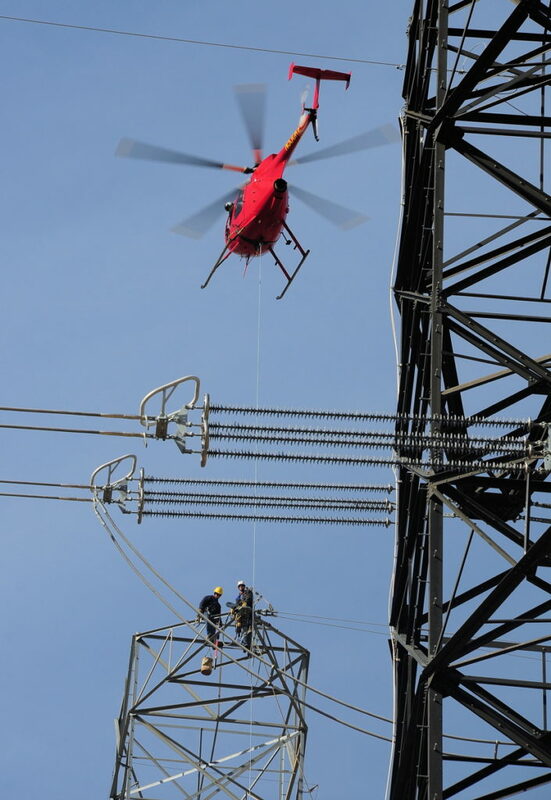 The reason why HEC has been so widely adopted by that sector is because it alleviates some of the risks associated with other work methods — whether that’s technicians undertaking the dangerous and fatiguing work of climbing 100-foot tall transmission towers, or working from the skids of a helicopter whose rotors can be within inches of a catastrophic strike. The hazards of the latter were dramatically illustrated on May 20, when an MD 500D operated by Air2 collided with a power line structure and terrain while performing aerial inspection and maintenance to the structure near Luling, Louisiana. One crewmember was killed and another seriously injured in that crash, while the pilot sustained minor injuries. “I am completely in favor of the FAA stepping in and creating some type of an HEC certification process,” Stewart told Vertical, explaining that he doesn’t believe that just anyone with a B authorization on their part 133 certificate should be able to fly people at the end of a long line. However, he believes that such a certification process should address the human factors that have been implicated in most HEC accidents, not just the equipment used. “If what we’re after is safety we need to be looking in different directions,” he said. The last sentence is by far the most appropriate statement made. The key to enhancing safety is to fairly and accurately assess the risk and mitigate to the best of ones ability. The hook is far more reliable than either the human factor or the aircraft itself flying in that environment. The first issue that I confront in this concept is why there ethically should be a difference between Class B HEC & ClassD HEC. Both are suspending a human on the end of a longline/winchline and transporting them to a location not permitting a helicopter to execute a safe landing. Why should a utility worker not require the same level of safety that a harbor pilot does? This is a regulatory loophole that has been extorted for decades that doesn’t pass the sniff test in the name of safety or best work practices. The second risk issue that comes to mind relates to the first. Why does Class D HEC require twin engine helicopters with OEI performance. It’s because it has been recognized that the majority of HEC flights occur outside of the recommended flight height/ velocity curve for any model of helicopter. If there is any kind of mechanical issue in a hover at 50-300 ft, there’s most likely going to be a catastrophic incident. A twin engine machine with additional safety measures like separate fuel supplies lessen the risk of a mechanical failure to the greatest degree. Statically, Helicopters like the MD 500 are not the best machine for HEC yet they are almost exclusively the machine of choice. It’s not in the pursuit of best practices in the name of safety, it’s all got to do with the cost of operation. The third issue which has been identified is the human factor. By far, the main cause of accidents are human caused, and sadly it seems accidents are continuing with common themes of poor communication and loss of situational awareness. What will decrease accidents far more than anything else is a standardized training regiment to cement in every crew members mind as well as company management the need continually review and keep both communication and situational awareness at the front and center or all HEC operations.